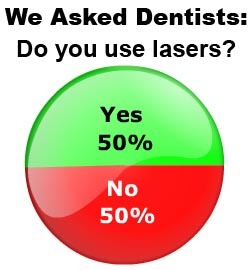 In this poll, we asked dentists: Do you use lasers on soft tissue for treatment of gum disease? Dental lasers appear to be quite popular these days! 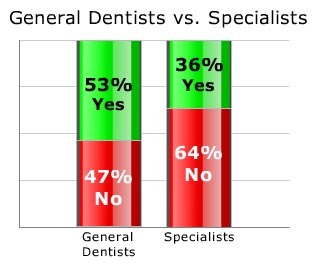 Respondents were split right down the middle, with 50% reporting they lasers are part of their periodontal management and 50% indicating they do not use lasers on soft tissue. In this survey, the groups most likely to report using lasers were general dentists and rural dentists. General dentists were significantly more likely to use lasers to fight gum disease than were specialists. On the one hand, some specialists don't treat periodontal disease themselves. On the other hand, equipment vendors may be particularly likely to target the general dentist for laser sales. Rural dentists were significantly more likely to use dental lasers in their practices than their colleagues in more populated areas. In fact, suburban dentists are twice as likely as rural dentists to choose not to use lasers on soft tissue. 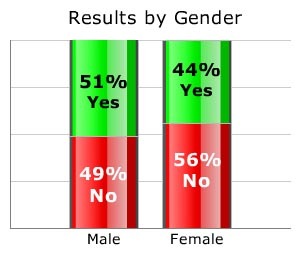 Gender differences were relatively minimal and are unlikely to be statistically significant. Where would I be without my dental laser?